The titans of technology have continually led the news cycle in recent years, as their reach has extended—for better or worse—into every corner of our lives. The big tech companies also have been generating exceptional stock returns: Facebook, Google, Microsoft and Amazon have together driven an outsized proportion of S&P 500® Index returns over the past several years. These four companies are traditionally viewed as “asset-light” business models, but more recently their capital expenditures have skyrocketed. This trend has led to some questions about the future—are above-average returns on capital at these companies sustainable? Is their profitability in jeopardy? For now, we see the growth in cap ex at these firms in a positive light, because the assets they are building are, in our view, essential components of their long-term competitive moats. Between 2015 and 2019, Facebook, Google, Amazon and Microsoft are on track to drive 79% of all incremental cap ex of S&P 500 Index companies. The four firms are expected to grow cap ex at over 31% per year, while the rest of the S&P 500 Index companies grow their capital spending by only 0.5% per year. When all is said and done, the four firms are expected to be driving about 11% of all capital expenditures across the S&P 500 Index universe by the end of 2019. Source: Factset as of 7/31/18. At first glance these numbers may seem like a mistake; after all, software and internet companies don’t build factories or manage massive logistical networks. But in fact, these companies are building data centers—the effective equivalent of factories and cargo networks for the internet—at a breakneck clip, because they are increasingly shouldering the burden of the entire economy’s enterprise data and application needs, not to mention the storage and management of the world’s texts, emails, photos and videos (excluding China, which is another topic entirely). 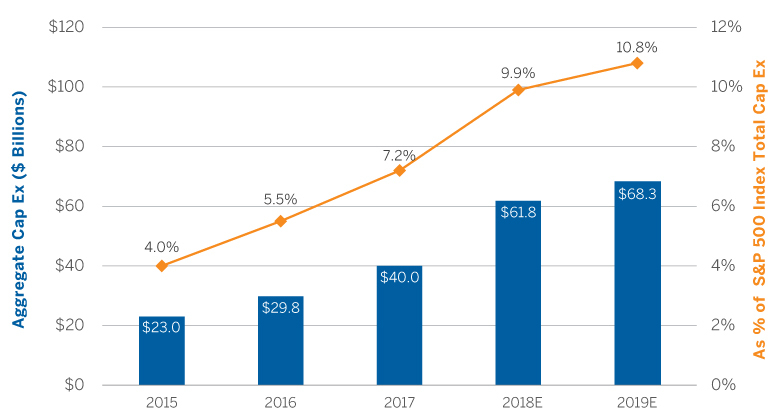 As companies across the economy become more comfortable moving their key business applications to the cloud, and platforms like Facebook, Instagram, YouTube and Twitch continue their exponential growth, it is no wonder that these four firms are on pace to grow aggregate cap ex—largely driven by data center spending—from $23 billion in 2015 to a whopping $68 billion in 2019. This shift is meaningful for these firms’ business models, as their aggregate cap ex has risen from 5.5% of sales in 2012 to 12% in 2018. But we view this rising capital intensity as less of a concern about profitability, and more of a positive sign for their ability to sustain market leadership well into the future. For one, the assets they are building will make it extremely hard if not impossible for other entrants to come along and compete on equal footing to deliver data storage and processing capacity. Moreover, they are in optimal position for the coming wave of artificial intelligence (AI) innovation. Various forms of AI have been theoretically possible for decades, but AI is now finally applicable in practical terms thanks to the scale of today’s datasets and the reduced cost of storage and processing; in fact, infrastructure to enable AI is one of the drivers behind the growth in cap ex we have been discussing. These four firms are leveraging their scale and making massive investments in AI capabilities, in an effort to enhance their value to enterprise customers, and make them even more reluctant to look elsewhere for a primary technology solution. Technology is driven by innovation and disruption, so we can never be sure what surprises lay ahead for the sector or for the companies we’ve discussed here. But we believe that the heavy capital investments being made by these firms are leading to important assets that can support the long-term sustainability of their business models.